As a transformative First Lady, Mrs. Obama launched and led four key initiatives: Let's Move!, to address the challenge of childhood obesity; Joining Forces, to support veterans, service members and their families; Reach Higher, to inspire young people to seek higher education; and Let Girls Learn, to help adolescent girls around the world go to school. Before becoming First Lady, Michelle Obama attended Princeton University and Harvard Law School. She started her career as an attorney at the Chicago law firm, Sidley & Austin, where she met her future husband, Barack Obama. She later worked in the Chicago mayor's office, the University of Chicago, and the University of Chicago Medical Center. Mrs. Obama also founded the Chicago chapter of Public Allies, an organization that prepares young people for careers in public service. 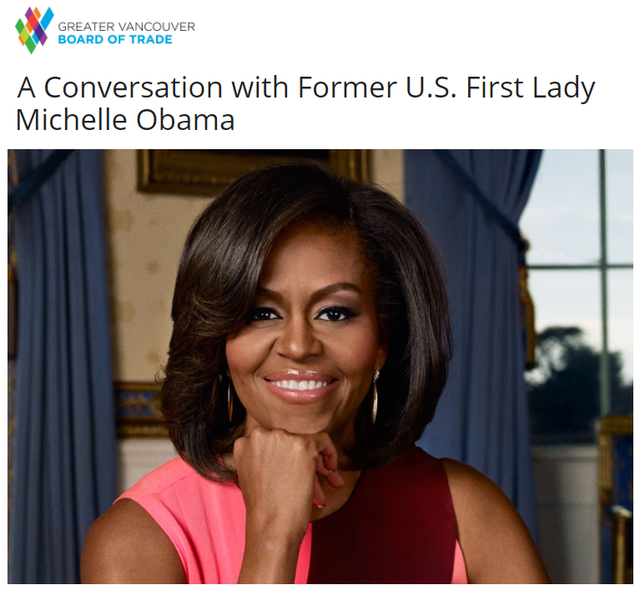 "Michelle Obama is a role model for millions of women and youth, and an inspiring speaker," said Anne Giardini, Chair of the Greater Vancouver Board of Trade and Chancellor of Simon Fraser University. "We are elated that the Board of Trade is able to welcome her to Vancouver, and we look forward to hosting a compelling afternoon conversation between Mrs. Obama and our WE FOR SHE and Signature Program leaders." The discussion will be moderated by Tamara Vrooman, President & Chief Executive Officer, Vancity. Boyden, a global leader in executive search, proudly serves Canadian organizations and institutions. As a long time supporter of Greater Vancouver Board of Trade, we are committed to excellence in leadership and proud to attend this unique event.